Notwithstanding my update for June’s astronomical events, I’ve been absent for the whole month of May. That is because it’s been a busy month for me. Here’s a bit of an update of what I’ve been up to from April 22 to now. On April 22, 2015, I delivered my presentation about my experience as an amateur astronomer that day. Throughout the presentation, I talked about the photos I took, honestly, and with a little bit of humour. It was well received by the audience. I hope to follow that up with another presentation a few years down the line. On April 28, 2015, I discovered the wonders of BackyardEOS. It’s a program that uses your DSLR camera like a CCD Camera. It was really effective as an imaging device, and as a focusing device. I got a few pictures like this using BackyardEOS. On May 8, 2015, It was a clear night, and I felt like taking another startrails image. Therefore, I made another startrails image from my backyard. I used over 700 frames, 5”, f/4.5, ISO-800. It turned out really well. This image was a difficult one to capture. I needed to balance how much light I would capture, while still capturing the movement of the stars. Too much exposure captured the light pollution of the city. Too little and the stars won’t show up. That’s why I chose 3″ exposure, because it wouldn’t capture too much light, while still capture the stars. f/5.6 to reduce the amount of light pollution captured, and ISO-1600 because we need to capture enough light. That is what I’ve been up to these days. Thank You for everyone’s support. Sorry for the sporadic blog posts. Keep looking up, you never know what you’ll find up there. Jupiter stood straight in the center of the eyepiece, and it was beautiful. We tested it further by putting Jupiter near the edge of the eyepiece, and after a while, it didn’t move at all. On January 23, 2015, my father and I, with clouds flying over us, decided to go to Glen Major Forest to image the Jupiter Triple-Transit event. Sadly, it was completely overcast there, which disappointed us. We soon drove back home, where we noticed that the clouds have started to thin, and Jupiter was visible through the clouds. Therefore, my father and I quickly assembled the telescope in the backyard, as well as my laptop to image Jupiter through my CCD Camera. We were able to get a good video footage of the Jupiter Triple-transit event. Unfortunately, I have not been able to process them yet. The program, Registax, has been giving me runtime errors, which is preventing me from processing the video footage. After we get the video, the clouds came in and ended our astronomy session. We packed up and got back inside. It was a successful night. We got good video footage, but we have yet to process the images. I want to get the video processed soon, and I will contact the developers for help. Keep Looking Up. You will never know what you will find out there. On August 18, 2014, I learned that there would a conjunction of two very bright planets, Venus, and Jupiter. Luckily, it was a clear night, and I decided to stay awake until morning to observe that event. Around 2 am, I looked around the viewing location, but I wasn’t able to find a good place to view the conjunction. Despite that, I decided to try and observe the event. At 4:40 am, I began to take my telescopic equipment outside and I prepared my telescope to view the conjunction. I quickly aligned to the Moon, and got it ready to observe. Looking at the Moon, I see it is a waning crescent, past the last quarter. After that, I noticed that the Pleiades were visible, and I aimed my telescope at it. It was great to see it again with and without my telescope. This deep sky object has an interesting mythology associated with them. In the most famous myth, there were seven daughters of Atlas and the ocean nymph Pleione: Maia, Electra, Alcyone, Taygete, Asterope, Celaeno, and Merope. They were minding their own business, when Orion the hunter saw them and started chasing them. Luckily, Zeus intervened and turned the seven sisters into stars. Unfortunately, Zeus did the same for Orion, allowing Orion to chase the seven sisters until the end of time. That is why the Pleiades are also called the seven sisters. After observing that deep sky object, I started to look for the spot where the conjunction will rise. Looking at at the horizon, and comparing it to the image on my phone, I realized that the conjunction will not be visible from where I was. 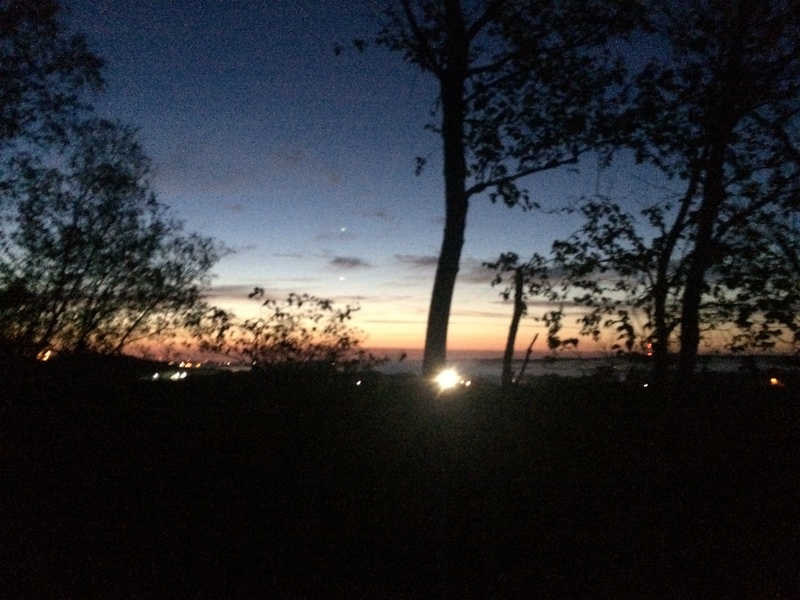 I looked at another location, and I saw both planets rising above the horizon, through the trees. I quickly brought my telescope to that location and looked around for the planets. 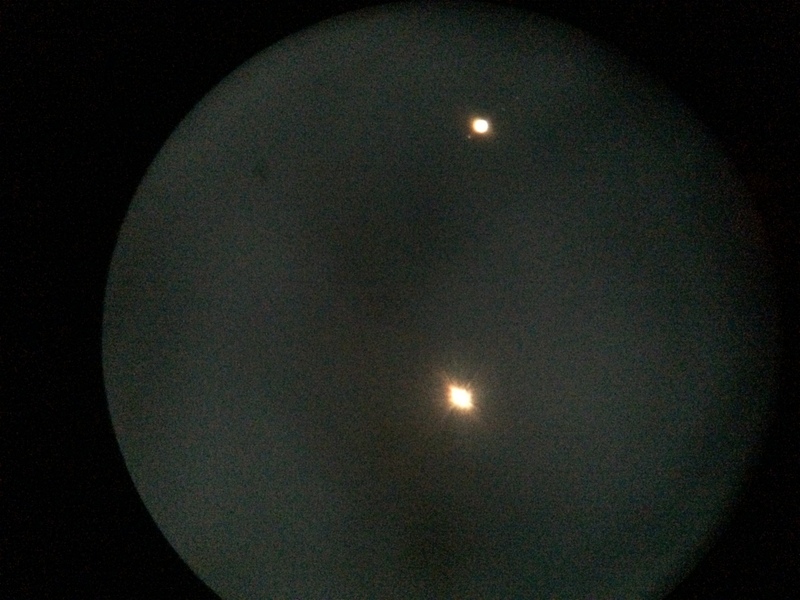 After a lot of fidgeting, trying to find it through the trees, I saw two dots in my telescope. I took a picture of it, but I wasn’t sure if it was the conjunction. Moving the telescope around, I was able to see both dots clear enough to reveal one of the dots moons. This confirmed that I was, in fact, seeing the conjunction of Venus and Jupiter. Conjunction of Venus and Jupiter. The planet with the Moons is Jupiter. It felt great to be able to see a unique event such as this meeting of two planets. I took many pictures of that event using my point and shoot camera. If anyone wants to see a conjunction as well, it’s not too late. There will be two more conjunctions, and both conjunctions will feature three celestial objects. On August 23, 5:30 am, it will be the best time to see the conjunction of Venus, Jupiter, and the Moon. Here is an image of what it should like provided you have a clear view of the horizon. 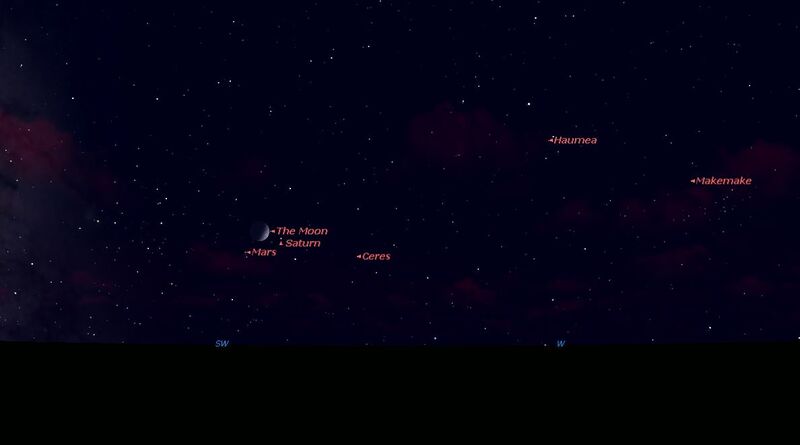 One week later, on August 31, at 9:20 pm, Saturn, Mars and the Moon will also meet up really close to each other. Here is an image of what it should like provided you have a clear view of the horizon. It is definitely worth viewing, especially if you can view the sun at the horizon. After I finished imaging the conjunction, I decided to pack up my scope and bring it inside. Once that was done, I decided to stay up and watch the sunrise. With a foldable chair in hand, I went to a small cliff near my house, where there was a clearer view of the conjunction, and the night sky. It was beautiful. 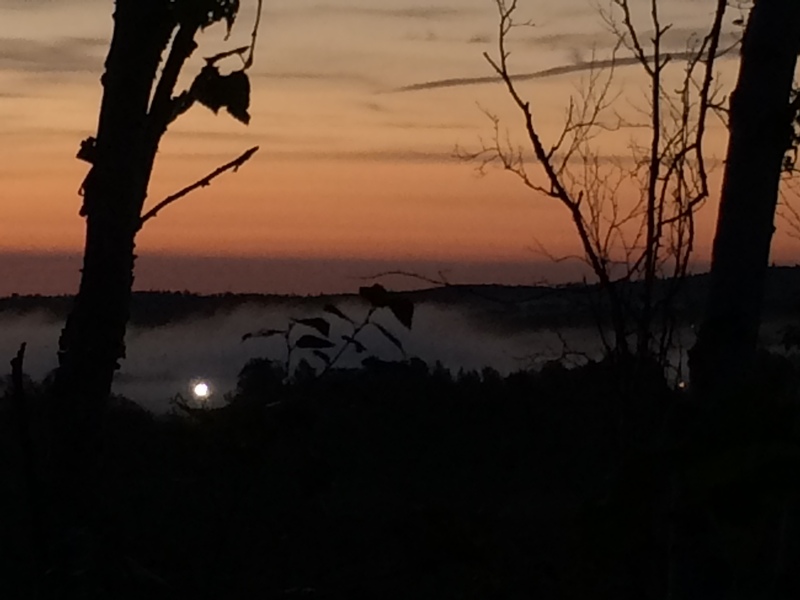 The factories beyond the cliff were covered in fog, and the rest of the cliff had a stream of fog surrounding it. It felt surreal. 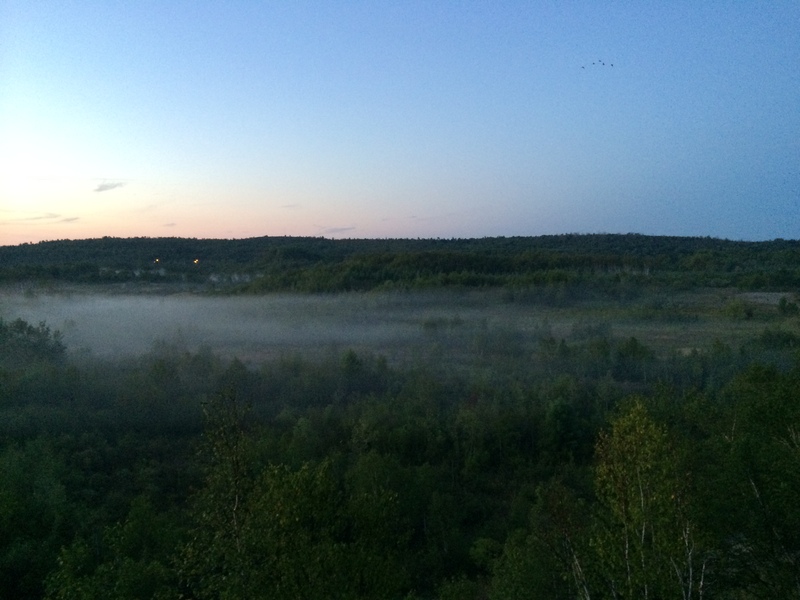 I spent an hour there watching the fog come and go, watching the planets hide behind a brightening sky, and watching the sun rise. It was worth staying up to see. After watching the sun rise, I went back home and soon after went to bed. Good Luck and Happy Observing! 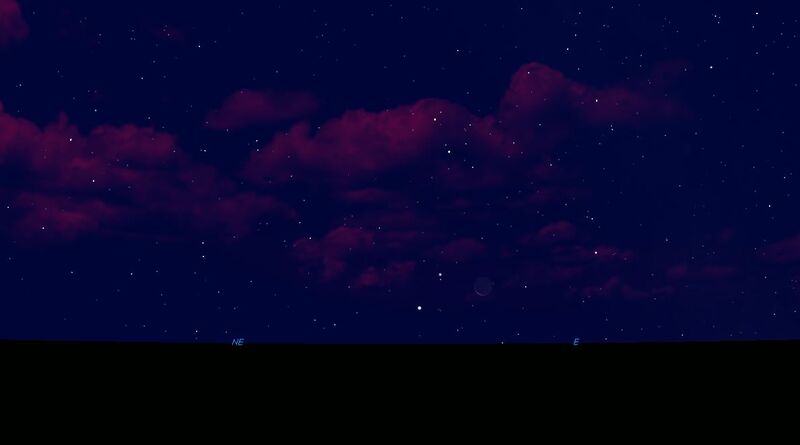 During the night of Saturday March 8, 2014 the skies were clear. Before that, an old Newtonian was discovered in my family’s closet. It’s a cheap one with only 30x magnification, but works nonetheless. That night, I looked at the moon with it. It definitely projects an image, but not a clear image. It looked very dusty. The image is not as good as my 8″ SCT (Schmidt-Cassegrain Telescope). After observing the moon, I decided to take my SCT outside the driveway to find Jupiter. Because of my issues with my telescope, I had to recalibrate my finderscope with my Telescope. Luckily, the Moon was above the horizon. I was able to find the moon after some struggle, and calibrate my equipment with it. It was satisfying to see the moon up close since my telescope developed problems. Pointing away from the light side of the moon I saw, without light interference, how the dark side of moon and the darkness of the sky look compared to each other. It was intriguing. 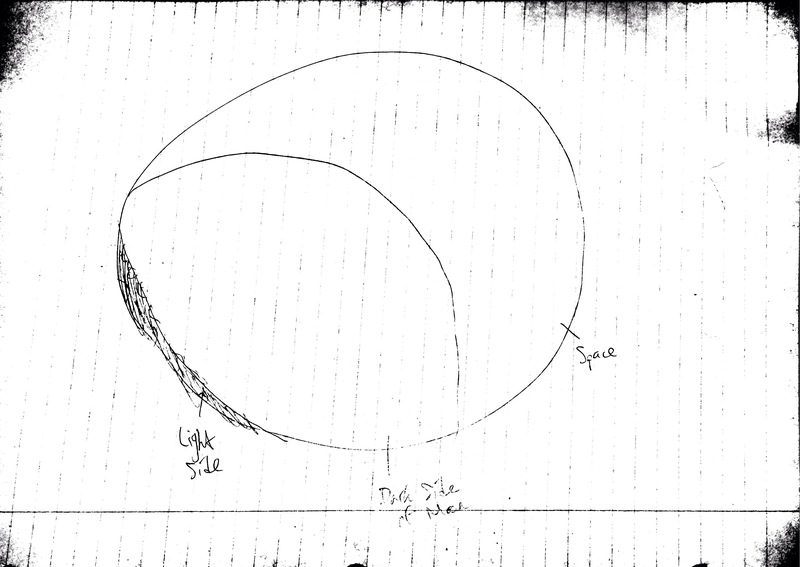 Sketch of the Moon meshing with space. After that, I decided to find and look at Jupiter. It was easy to find Jupiter, falling to the horizon on the western Sky. Looking at it through my 25 mm eyepiece, it looked the same as always. In addition, three of its four moons are visible. It was lovely. However, I had an idea. The newtonian telescope that my family found has a 20 mm eyepiece. I know that when you divide the focal length of the telescope with the focal length of the eyepiece, you get the magnification of the telescope. A 2032 mm telescope with a 25 mm eyepiece will yield 80x magnification. Knowing that, I decided to put the 20 mm eyepiece from the newtonian onto the SCT. If the math is right, then my telescope should have 101.6x magnification and, as a result, Jupiter should appear larger. I put on the eyepiece, and then my put my eye on the eyepiece, and I saw a slightly bigger Jupiter. It was beautiful. If the math continues to hold, then I plan on getting smaller eye piece to get closer to Jupiter. It was a step forward in my astronomical journey. 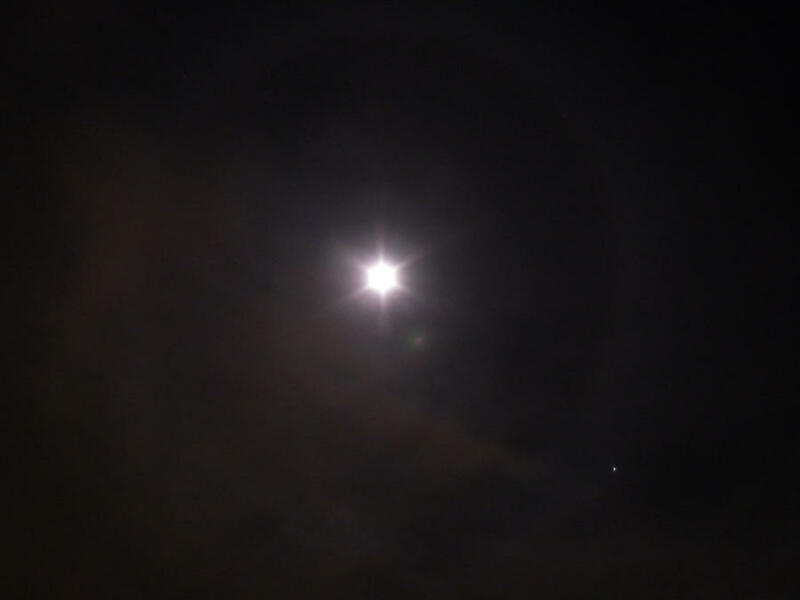 The star halo I saw was a bit more pronounced than the image. Looking at my clock, I realized it was three in the morning. Daylight Saving Time had already come into affect, which means it was actually four in the morning. Knowing that, and that the cold is starting to get to me, I decided to pack it in for the night bringing all my equipment inside safely. Overall, It was a successful observation. I saw the beauty of the moon, Jupiter, and an intriguing star. When I was doing research and talking to experts, I learned that it might be a deep sky object with only the heart visible, either M51 or the Ring Nebula. It’s interesting that a galaxy could look like that to my eye. However, I can’t be sure; not until I see it again and image it. I have taken many steps forward in my astronomical observations. I hope to continue that in the coming days.